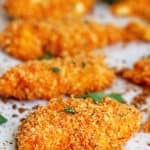 A deliciously easy and perfect weeknight oven fried chicken tenders recipe which is crispy and filled with flavor. Add chicken and full bottle of dressing to a medium sized bowl. Using tongs, toss the chicken in the dressing to full coat. Marinate chicken tenders for 3-4 hours. Preheat oven to 375° and cover baking sheet with parchment paper and spray liberally with non-stick cooking spray. In a shallow bowl, whisk together panko crumbs, paprika, lemon pepper, salt and cayenne until combined. To assemble, carefully dip each tender into panko mixture evenly coating each piece then place on baking sheet. Once done coating all chicken, liberally spray tops of chicken tenders with additional cooking spray. Bake 13-16 minutes or until chicken is cooked through and outside is golden brown. Serve with side of ranch.